Y’all probably think I’m crazy. But if you didn’t before, you will now. I somehow managed to find myself alone in a store with no deadline. I wandered – meandered really – down every.single.aisle. I was standing there trying on hats when a <sarcasm>lovely</sarcasm> employee <sarcasm>kindly</sarcasm> reminded me that I’m not supposed to try on the merchandise and take pictures. So I hung them all back up and kept walking. 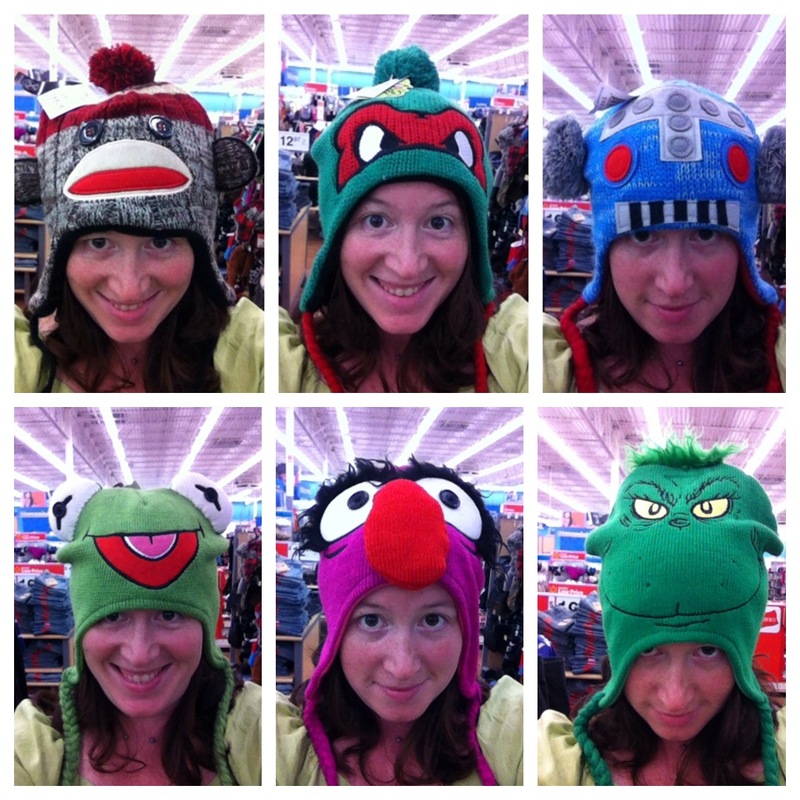 Lo-and-behold, two minutes later I found myself in another aisle of happy hats! It was just too tempting to not take more pictures. For the record, I will never be as adorable as Vivi. But I will always crack myself up with owl jokes. Who knew that one little hat could make me so happy? 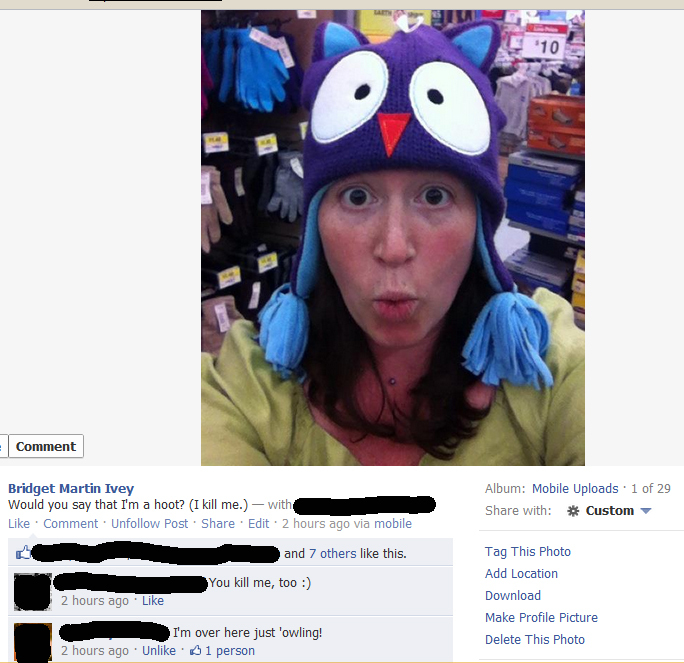 I don’t see why you can’t try on a hat and take pictures. It’s not like the picture is going on your head to keep you warm later. Uh, people kill me sometimes. You gave me a laugh and a smile last night with all your hat pictures, and I needed that, so thank you for breakin’ the rules! Also, baby Vivi as a platypus for Halloween???? So cute! Um, Jack is on my lap freaking out over those hats, so You’re going to have to share their secret location with me. Those are so cute! I bet you had a ball. That is so hilarious. Keep smiling and know that you are loved in all of your craziness!! 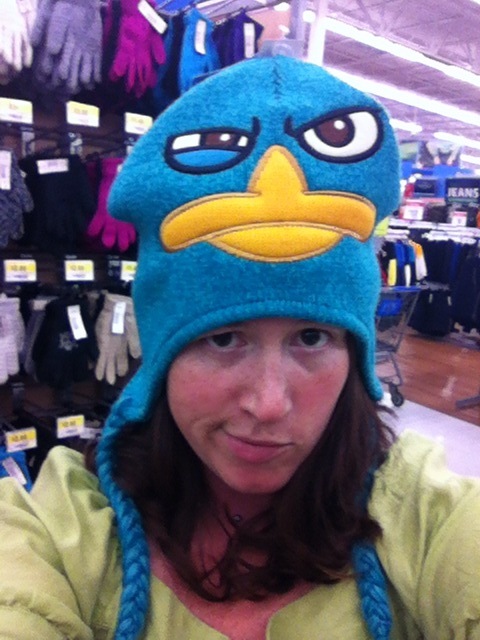 I was at the bestie’s house when I got that text last night-we laughed and then picked which hats we wanted. I personally want the Animal hat but we both agreed that you rocked that TMNT hat.